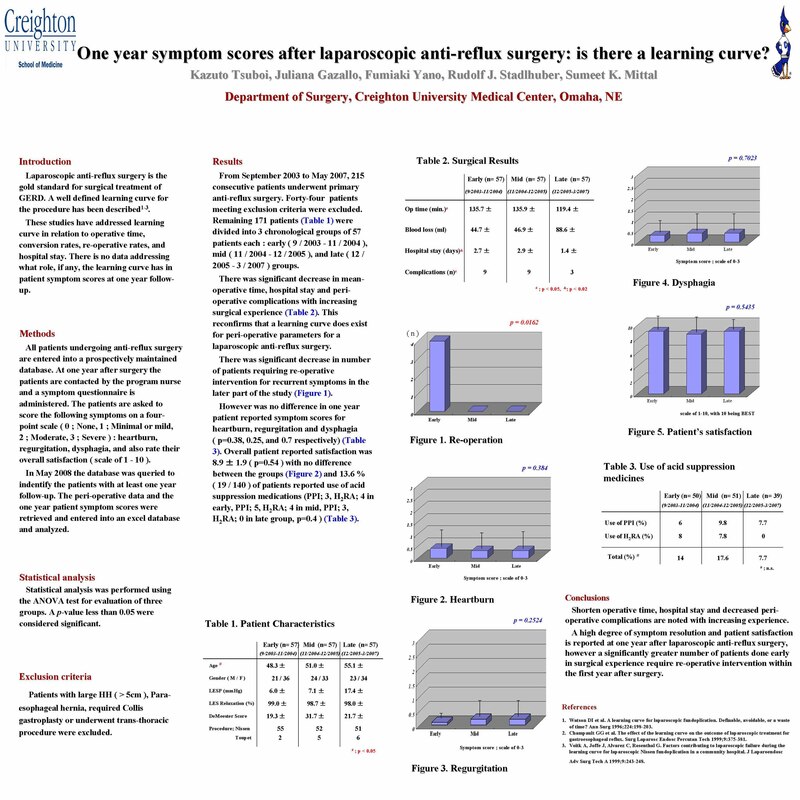 One Year Symptom Scores After Laparoscopic Anti-reflux Surgery: Is There a Learning Curve? Introduction: Laparoscopic anti-reflux surgery is the gold standard for surgical treatment of GERD and a well defined learning curve for the procedure has been described. Aim of this study is to assess if the surgeons experience has an effect on one year symptom scores and patient satisfaction. Methods: All patients undergoing anti-reflux surgery are entered into a prospectively maintained database, including one year post-operative symptom scores. The database was queried in May 2008 to identify patients who had had one year follow-up. To decrease variability patients with large HH ( > 5cm ), Para-esophageal hernia, required Collis gastroplasty or underwent trans-thoracic procedure were excluded. Results: From September 2003 to May 2007 215 consecutive patients underwent primary anti-reflux surgery, of these 171 patients ( 103 women, mean age was 51.5 } 14.0, 18-87 ) met inclusion criteria and were divided into 3 equal groups : early ( 9 / 2003 – 11 / 2004 ), mid ( 11 / 2004 – 12 / 2005 ), and late ( 12 / 2005 – 3 / 2007 ) group. There was significant decrease in mean-operative time ( p< 0.05 ), hospital stay ( p< 0.02 ) and post-operative complications ( p< 0.05 ) with experience. Additionally the number of patients who required re-operative intervention also decreased significantly with less patients requiring re-operative surgery as experience increased. There was no difference in one year patient reported symptom scores for heartburn ( mean; 0.3 } 0.7, median; 0 ), regurgitation ( mean; 0.1 } 0.4, median; 0 ) and dysphagia ( mean; 0.3 } 0.6, median; 0 ). Overall patient reported satisfaction was ( mean; 8.9 } 1.9, median; 10 ) ( p=0.54 ) ( scale of 1 - 10 ) and 13.6 ( 19 / 140 ) % of patients reported use of acid suppression medications. Conclusion: Decrease in need for re-operative procedures is noted with increasing procedures however patient reported symptom scores do not change with experience. A high degree of one year patient resolution and satisfaction can be achieved even early in experience.